Springfield Creamery, the makers of Nancy’s Probiotic Foods, is a family owned Eugene, Oregon company that was founded in 1960. 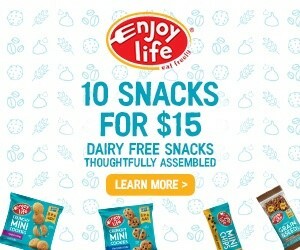 They are dedicated to their dairy product lines, but have also catered to dairy-free customers for years. 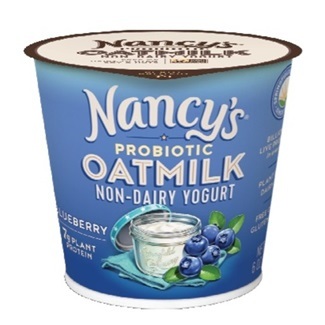 Their Soy Yogurt was recently discontinued, but they’ve replaced it with a full range of non-dairy Nancy’s Oatmilk Yogurt. 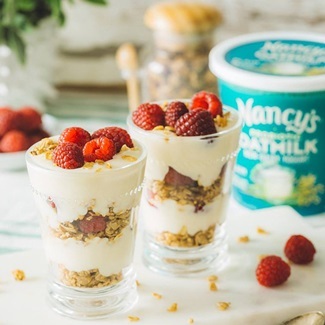 It’s dairy-free, soy-free, and has 30 to 50% less sugar than the leading plant-based yogurts (and many dairy yogurts). 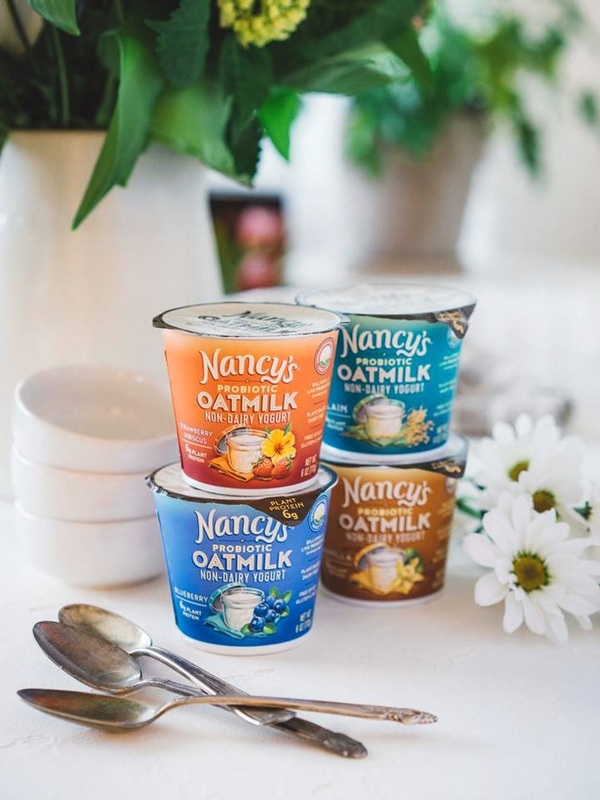 To keep it friendly for most dietary needs, Nancy’s Oatmilk Yogurt is made with an oat base and enriched with faba bean protein. 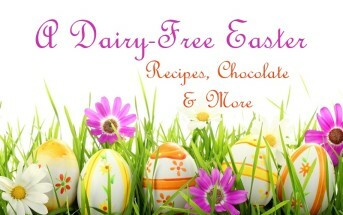 Yes, it’s free of not only dairy, nuts, and soy, but also pea protein! And it’s stocked with 5 types of live cultures for plenty of probiotic action. These yogurts are made without top allergens, and do not have a “may contain” statement for any allergens. The container we purchased actually had dairy-free, gluten-free, nut-free, and soy-free listed right on the package. 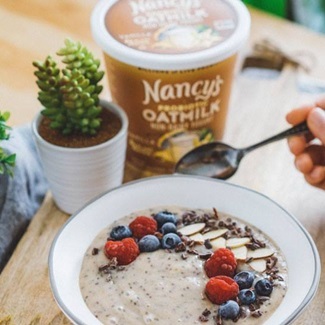 However, they are made on shared equipment with dairy (we’re assuming yogurt), and they do not specify certified gluten-free oats on the ingredients. 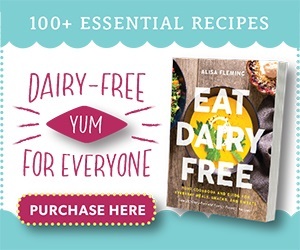 All flavors of this dairy-free yogurt are sold in single-serve containers. The Plain and Vanilla are also sold in multi-serve tubs. Availability: Nancy’s Oatmilk Yogurt is sold at Sprouts, Market of Choice, New Season’s, Safeway (Denver area), Haggens, Central Markets, and numerous independent co-ops across the U.S.
Certifications: Nancy’s Oatmilk Yogurt is Non-GMO Verified and Certified Kosher DE (for dairy equipment, not ingredients; see our Understanding Kosher Guide). 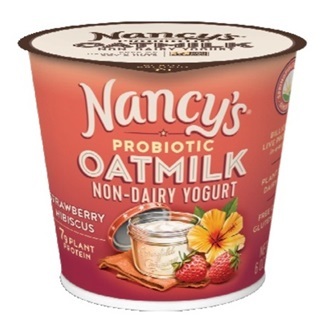 For More Product Information: Visit the Nancy’s website at nancysyogurt.com. I prefer to buy unsweetened, so I can sweeten only as needed. I like that the Plain contains no added sugars. 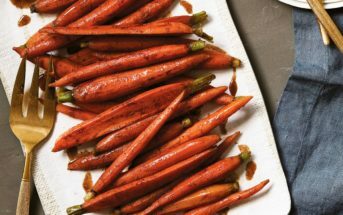 It doesn’t even have a hint of sweetness, so in theory, you could use it for savory dishes too. It’s a little sour, not really tart, and the consistency is close to traditional yogurt, but the mouthfeel isn’t nearly as rich. It is fairly smooth though with just a bit of oatiness in the texture. I did try adding a little sweetener, but still wasn’t a big fan of the flavor. The flavored varieties might be more dialed in. Great ingredients, strong nutritional panel, but the texture is just not ideal. 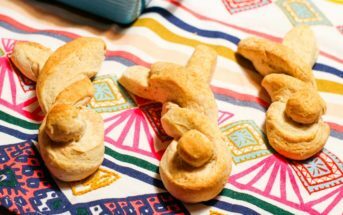 It’s very thick, yes, but in a way that’s very starchy and gummy, rather than naturally rich. I had the strawberry hibiscus and found the berry flavor somewhat light, but at least, it had a reasonable level of sweetness, which is hard to find in most fruited yogurts. Mild oatmilk flavor, with sour undertones. I tried the vanilla. I like it. 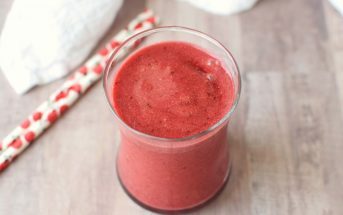 It has a mild oatmilk flavor, with sour undertones. Could be my fave dairy-free yogurt alternative yet.